I'm always promising that next year I'll make some attempt to collect gingko nuts and do something or other with them. I've had them once or twice in restaurants, and they are delicious--subtler and more interesting chestnuts. The challenge, of course, is removing the husks, and the embarrassment of interacting with plants in the city. 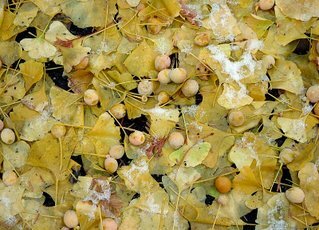 Wow, I thought I was the only one who dreaded the fall because of Gingko trees. I moved to DC three years ago and now refer to them in my own head as dog sh*% trees because that's what the rotting berries on the ground smell like and the whole neighborhood reeks. My significant other just referred to them as crapberries ... they are worst part of fall, and I fear that the season seems to arrive later and last longer, each year. Perhaps a sign of global warming/climate change? They smell like vomit... I live on a Chicago block and the whole street REEKS. They are sappy and get all over your shoes. I cross the street to avoid them. There were three Asian ladies colleting them when I went for coffee a little while ago. UGH. The odor is so repelling and makes me gag. If you cut down a tree in New York City, you must plant three trees in its place! Ridiculous considering the hinderence these berries are to the quality of life. I can easily say I hate these trees. I have one on my parking. For years it was a male tree then it changed to a female and started dropping berries. Yes, they smell like a mixture of dog doo doo and vomit. I've had to dig up my entire parking because hundreds of the seeds rooted and started growing. But I've heard they can be injested and extract is sold as memory aid (ginkgo biloba). Anyone know "how" one would eat them/prepare them?